Hello to all my name is Sebastiano from Italy and I'm new here. I'm came back to large scale after several years in the small and the quarter scale. 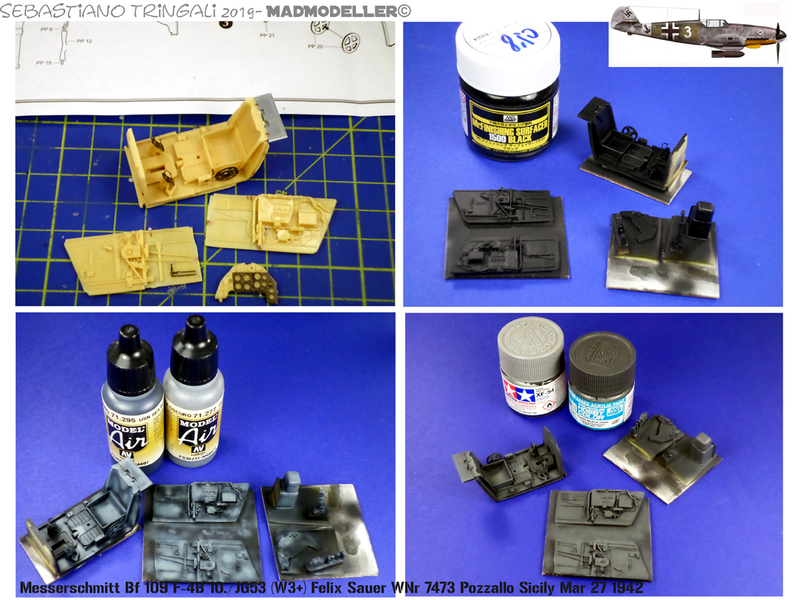 1/32 was my first love in my modeller carreer, so is time to go back home. 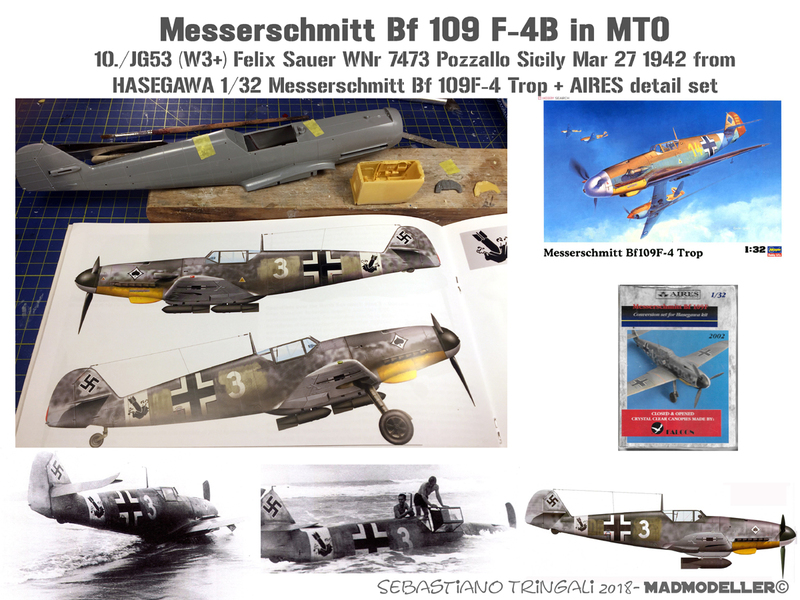 My first here is a Messerschmitt-Bf-109F4-10.JG53(Jabo) in MTO (Sicily-1942) using the F4-trop Hasegawa kit and some parts from old Aires G-6->F-4 conversion set. Criticisms and suggestion always appreciated. For first I'm start to rivets all the plane from the fuselage and to the wings. 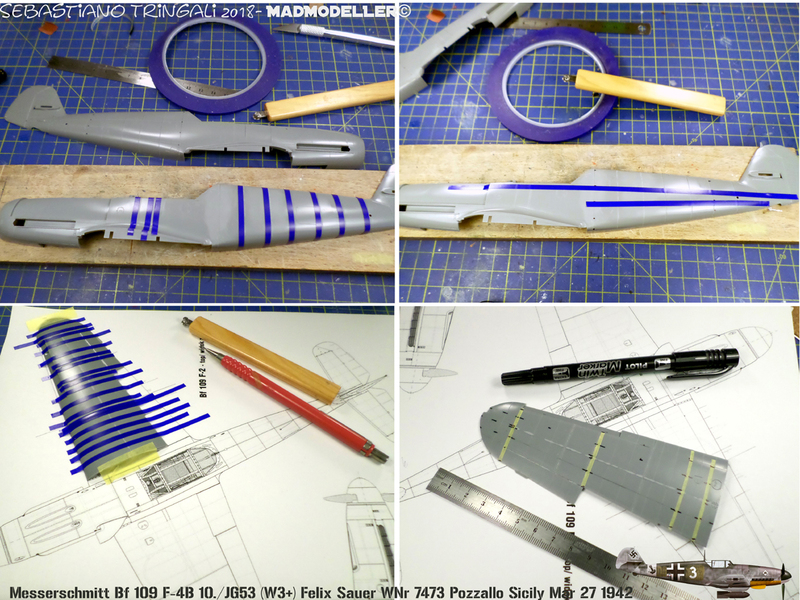 Using Kagero scale plane, Rosie the riveter and 3M blue tape and a lot of patience. I hate this kind of work!! 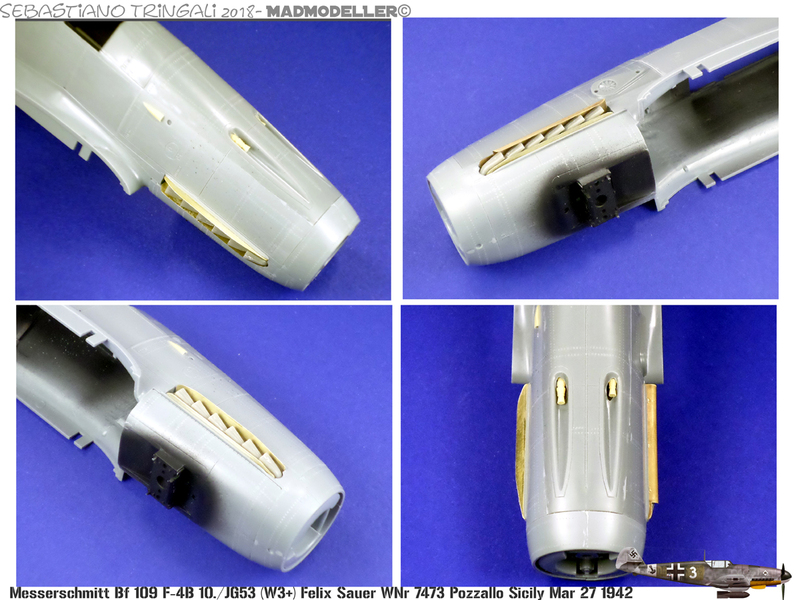 completed the riveting process, I start to scratchbuilt the larger curved exhaust guard/deflector on the left side of the engine cowling, using the process showed in the following pics. The metal foil is molded after it is passing for few second on a candle flame to make the brass softer. Sebastiano, fantastic start. nice choice too. I have that kit - and conversion - in the stash somewhere myself. Ciao Seb!! Great start on the F... where in Italy are you? Welcome to LSP!! Looks like you're off to a great start with this one. Nice progress on this one. Of all the 109s, I've always liked the schemes based out of Italy and the Mediterranean best. Welcome to the forums BTW! Looking good! Welcome to LSP! 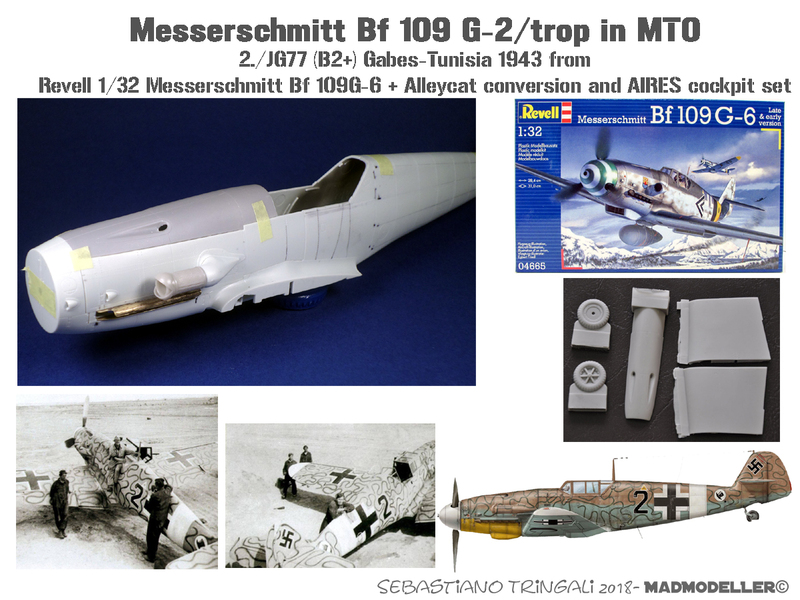 The "109F" has always been my fav as well...can't go wrong with this kit either,with the minor changes Has. made to it. After a long time, I come back to update this post also thanks to work done in the Christmas holidays. I've started to paint the interior using the "black base" thecnique with Mr Surface1500 adding some sprayed spotted texture of light (raised parts) and medium grey and at last aome light layer of RLM66 until the result let me satisfyed. I'we doing somethign on the wheel wells , openig the holes on the inner part. I'dont like too much the Hasegawa wheel wells because are no detail on the surface so probably I'll replache these with some aftermarket parts. 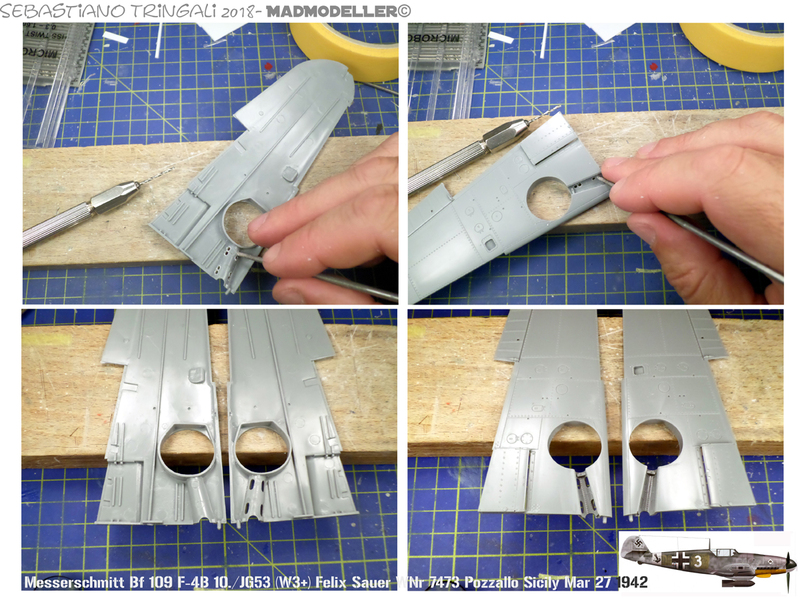 In the meantime, I've take back the other Bf 109 that I've stopped some months ago for some problems to fit the Aires cockpit into the fuselage. 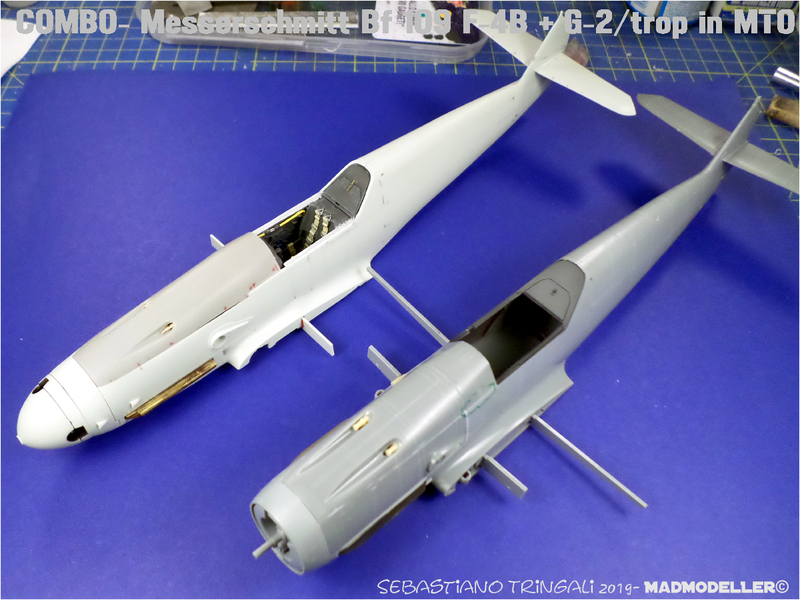 It is the G-6 Revell that I would to backdate into a G-2/trop using the Alleycat set. The Revell is lovely and have very fine details. The camouflage I've chose is the standard desert scheme in RLM 78/79 but with an interesting field variation of an overpainted "wave mirror" in green RLM80. In this way I could go in tandem, saving a lot of time. I'dont have the decals for this G-2 but I think that not will be a big problem. I'll try to use self made mask for painting numbers and unit emblem. So I've started to detail the external surface adding rivets and emptying the inside of the exaust stacks and the air vents and scratchbuilding the exaust protection as doing on the F-4 model also I've added the sand filter from Quickboost. I painted the cockpit as described for the F-4, in the end the result satisfies me. Just a little touch of desert sand on the floor using pigments. and after the worst challenge.....put in the Aires cockpit. 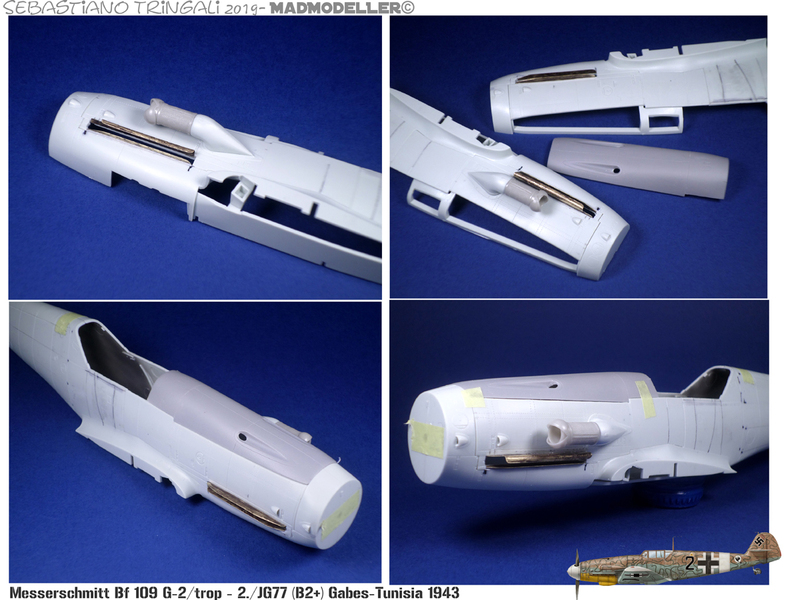 I think this is an adjustment of the old interior for G-2 hasegawa kits to use it in the new revell . At the end, after a lot of file and sandpaper work, I did it. 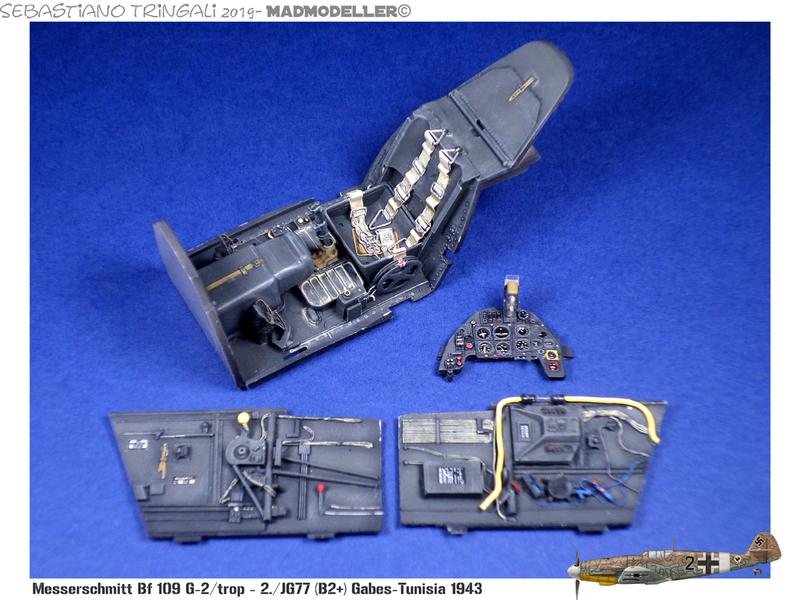 In my opinion the set Aires is not essential because the Revell's interiors are beautiful and detailed, only the rear seat belts molded together with the seat back (5 minutes working with the round blade cutter). I do not know why I took this set. 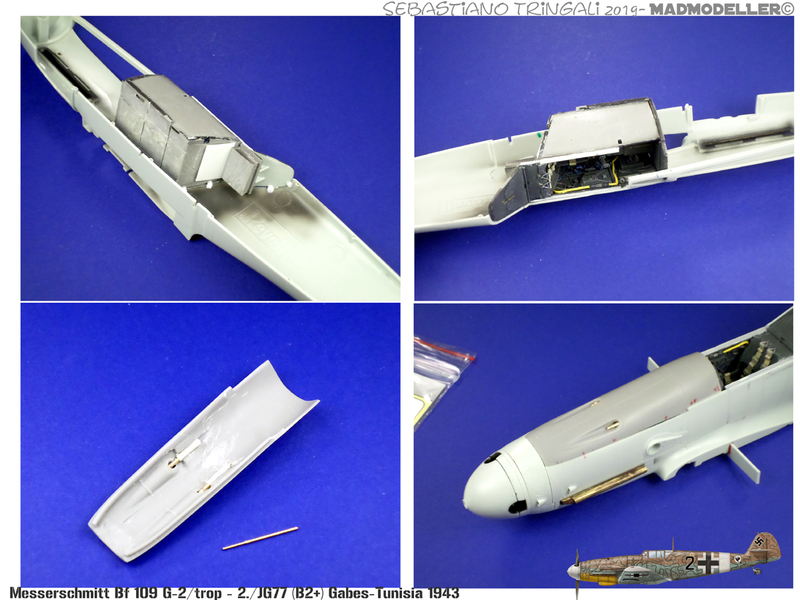 Now I can close the fuselage and glue the resin top of the engine cowling. 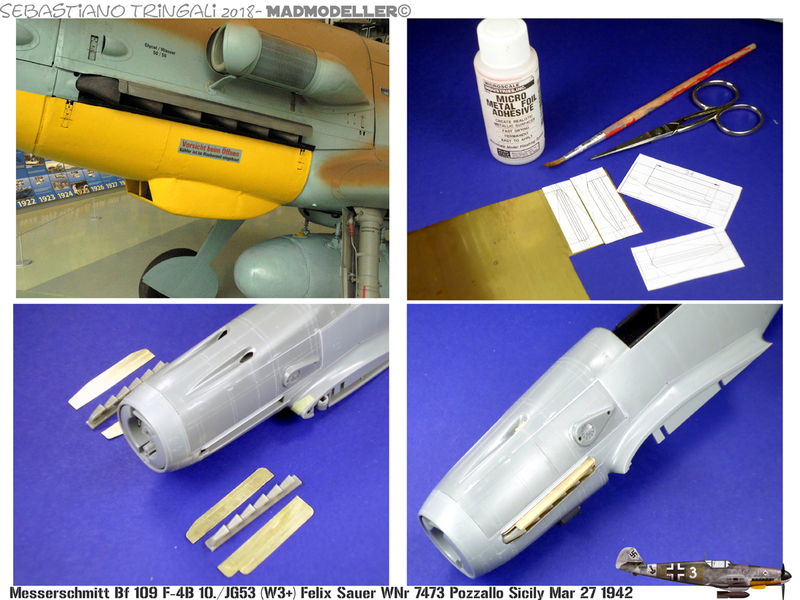 To be able to assemble the two brass MGs after painted the model, I glued two small styrene tubes inside the cowling just in correspondence with the holes for the machine guns. It's all for now, hope you like the progress. Awesome painting of the cockpits. Didn't know about the Allycat G2 conversion set. Fantastic work so far! I'll be watching closely since I plan to do a G-2 (photo recon) conversion too. One little thing jumped me: I think you have the dust filter rotated 90 degrees. The doors should open horizontally, or isn't it glued into place yet?